Printer cartridges are a consumer product category with a variety of architectures of control exhibiting characteristics discussed on this site. 25 Canon (Japan) printers detect whether or not genuine Canon replacement cartridges are used (the ‘handshake’), and refuse to print if a non-Canon cartridge (often cheaper) is detected. The Japanese Fair Trade Commission is investigating. Canon has previously lost a case over whether external companies recycling (refilling) Canon brand cartridges infringes Canon’s intellectual property rights . Refilled cartridges retaining ‘genuine Canon cartridge’ chip possible; Self-refilling is also possible. 26 Some Hewlett-Packard printers report that printer cartridges need replacement and also shut down the cartridges at a pre-determined date regardless of whether they are empty–even if they have never been used. The argument could be made that this is to protect the consumer from a cartridge that no longer functions properly due to ink becoming denatured or the print head blocked, but this is a rather weak benefit for the consumer. A Georgia woman is currently suing Hewlett-Packard over this issue, with the suit seeking class-action status  Providing consumers know to avoid Hewlett-Packard printers with the expiration function, they can choose alternatives. 27 Some manufacturers which produce printers and cartridges under different brands with different pricing levels allegedly permit the cheaper brand’s cartridges to function, but make sure the print quality is poor to discourage consumers from further purchases. “I have a Dell AIO 920… which is a rebadged Lexmark 1150. Local PC store does Lexmark cartridges for the 1150 that fit the Dell–almost. The cartridge is identical apart from the top cover–it’s a recessed ‘U’ shape on the Dell cartridge, but has a raised diagonal plastic tab on the Lexmark–upshot is, you load it in, close the lid, and all your printing is badly misaligned (colour against black). No way of adjusting it to fit with the supplied software as it is so far out of alignment” . “Solution? Snap off the diagonal tab–works a treat!”  However, if this had been a software issue rather than a simple physical one, there may not be such an easy work-around. * Lexmark laser printers perform a handshake with cartridges and will not operate with cartridges identified as non-Lexmark. Static Control Components replicated handshake to enable replacement cartridges to work with Lexmark printers . Lexmark sued SCC under the DMCA; the sale of the SCC handshake chips was banned but the ban was lifted on appeal. “The DMCA was not intended to create aftermarket electronic monopolies…[this] is amajor victory for the consuming public and American companies” (Ed Swartz, SCC chief executive) . Alternative laser printers available which do not have ahandshake function. Pingback: Architectures of Control in Design » Friend or foe: Battery-authentication ICs? I have just retired after working for twelve years supporting IT users in their own homes. Every four years we changed the HP printers and after each change over I conducted tests on the cost of printer consumables. 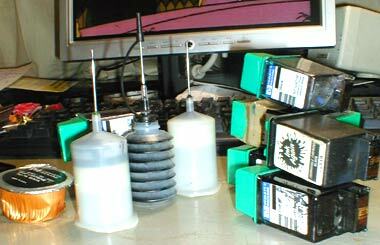 After each changeover the amount of ink in the the cartidges (started with one, then went up to two, and eventually to four) was less and the cost per cartridge more. After the second changeover the cartidges contained a chip which prevented the use of cheaper alternatives. During the last three years the cartridges had an enforced expiry date and with replacement ink supplies for about 80 users under central order and distribution you can only imagine the chaos when perfectly good cartridges suddenly stopped working! No wonder printer manufacturers sell their printers at huge discount so that they can make a killing on the sale of ink cartridges!